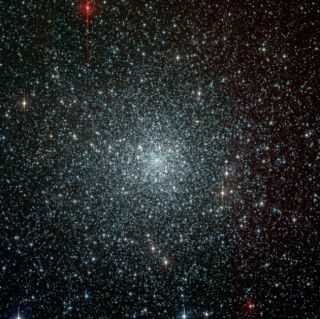 The globular cluster NGC 6397 is about 7,200 light-years in the southern constellation Ara. It contains about 400,000 stars. Astronomers have found evidence of one way a strange type of star called a "blue straggler" might form: by siphoning stellar material off a neighbor. Blue stragglers are anomalous young stars found in globular clusters of much older stars. They appear to be bluer and hotter than their neighbors. These stellar oddities have mystified astronomers, who don't know exactly how they form. Any stars that coalesced in a globular cluster should be the same age and similar in appearance, according to conventional thinking. The two most likely scenarios astronomers have devised for their formation are stellar collisions and feeding off of older stars in a binary system. The new study, published in the Astrophysical Journal, found evidence of the second mechanism. "Our discovery is ... a fundamental step toward the solution of the long-standing mystery of blue straggler formation in globular clusters," said Bologna University astronomer Francesco Ferraro, lead author of the paper. The cores of globular clusters are very tightly packed, so astronomers think it is likely that stellar collisions that could form the blue stragglers are frequent and fairly efficient. In this new study, astronomers used the European Southern Observatory's Very Large Telescope to examine the chemical signatures of 43 blue stragglers in the globular cluster 47 Tucanae. They found that six of the unusual stars had less carbon and oxygen than the others. This anomaly indicates that their surface material has been sucked from the deep interior of a parent star in a binary system. "This is the first detection of a chemical signature clearly pointing to a specific scenario to form so-called 'blue straggler stars,' in a globular cluster," Ferraro said.